The latest upgrade guide is very well written and covers the complete upgrade process. However, I am listing down an overview of the upgrade process and things to remember before starting the upgrade. I hope, this shall enable you to achieve a smooth upgrade. Before installing AX 2012 R3, All R2 components needs to be uninstalled in the environment in which the upgrade is planned. 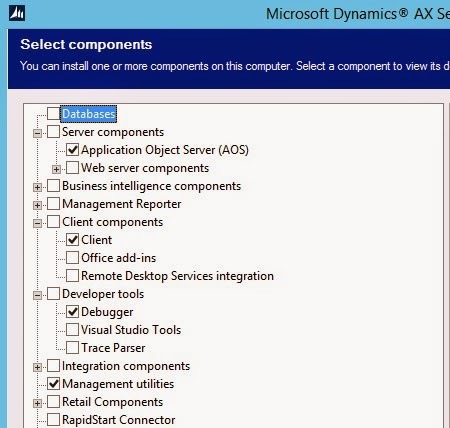 During the code & data upgrade process, Make sure that you Mark all the steps in the code/data upgrade checklist before you restart AX client/AOS as complete even though it is not yet completed else a blank(empty) start up application workspace will be displayed and no modules will be listed when you re-open the AX client. Always compile the application using command “axbuild xppcompileall” from the command prompt whenever compilation is required during Code/data upgrade process. Please make sure that the below steps are followed else during the data upgrade, the pre-sync and post-sync jobs might struck in ‘Ready’ status and may not be executed. a. 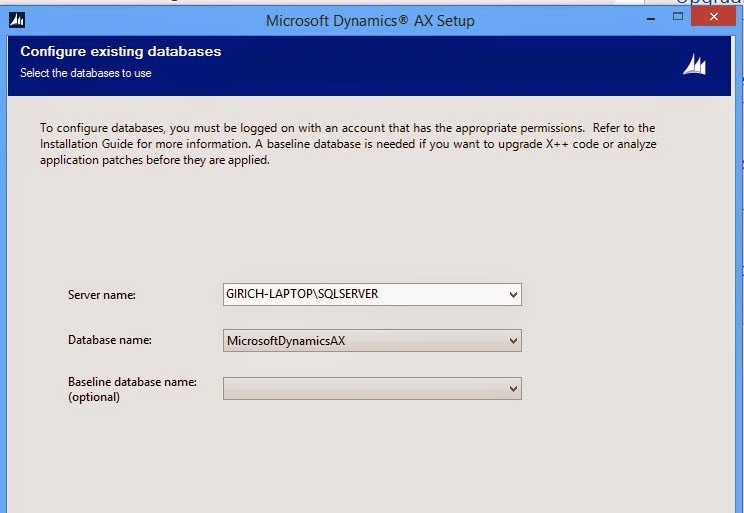 The user account logging into the Dynamics AX client to run the checklist is the Dynamics AX admin account and NOT just a member of the system administrator security role. b. Check the userinfo table in SQL: select * from userinfo where ID = 'admin' to make sure a record for the "admin" ID has a valid SID, networkdomain, and networkalias for each partition in the environment. c. Check the batch form directly in the client by going to System Administration | Batch Jobs | Batch Jobs and check the Createdby fields and if the DataUpdate job has already scheduled as an account other than admin, you need to start the upgrade over by logging in as the admin account or you may be able to change the records in the batch and batchjob tables to be the admin account. d. Remove any records in the SysServerSessions table that are not valid in this environment, you should do this while the AOS servers are stopped and make sure to have a SQL backup first. f. Delete any AOS instances here that are not valid in this environment. h. Make sure batch server schedule is setup with proper start/end time i.e. Start time 12:00:00 am end time 11:59:59, so there are no gaps in the scheduled time. i. Make sure that the remaining valid AOS server that is also marked for batch has the blank batch group and data Update batch group assigned to it. k. Check for any previously running batch jobs that are stuck in a status of Executing. You may need to change the status to cancelled or remove the Job from the Batch and Batchjob table from the SQL backup. Step 1. Synchronize, Compile and Generate CIL on the AX 2012 R2 application. Step 2. Stop AOS & then back up model and business data databases. Step 3. Restore the model and business data databases in a new environment. Step 4. 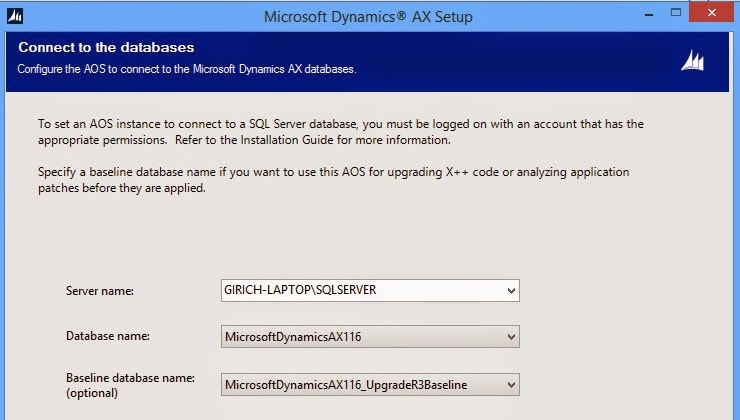 Start the AX 2012 R3 installation setup on a new environment. Step 5. Select only the databases component. Step 6. 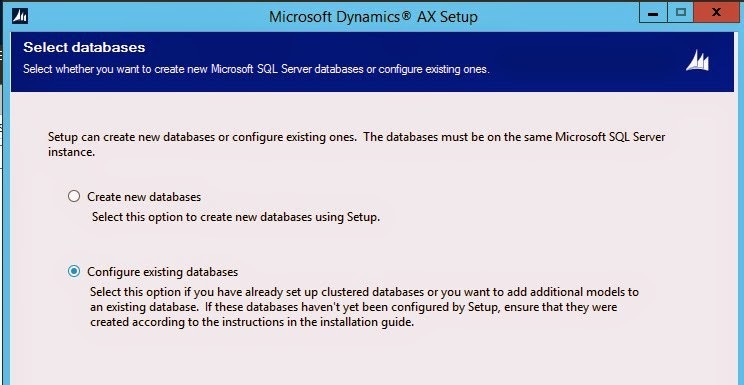 Select configure existing databases. Step 7. In this step, Assign the R2 database and make sure that the Baseline database name field is left blank during this procedure. Step 8. On the Select additional models page, select the Foundation model, Foundation Upgrade model, and any other models that you require for your deployment. Select the Foundation Labels model only if you are using country/region-specific features. After this step, the system creates a new baseline database which contains upgraded AX 2012 R3 models in the SYS, GLS, FPK, and SLN layers and Non-upgraded customer models in the ISV, VAR, CUS, and USR layers. Step 9. Now install all other required AX components. Step 10. Now, assign the database and upgraded baseline database in this step. Step 11. Once, the installation is completed then compile the whole application using the command “axbuild xppcompileall” from the command prompt. This compiled the whole application for me in just 30 to 40 minutes. Step 12. Now restart AOS and proceed with the code upgrade & data upgrade checklists. Follow the code upgrade document on the complete details. Iam upgrading from AX2012 R2+Cu7 to Ax2012 R3, I have followed your blog but iam not getting screen to update Baseline upgrade database. I have updated baseline database in Server configuration and have compiled the application as per your blog but while opening AX client blank page is opening along with error log. Kindly help me out where iam doing wrong. During steps 7 & 8 where you select the R2 database and install the database components, the system will automatically create a baseline database which you can select during Step 9(installing other components and assigning to baseline database). Let me know if you are still facing issue.